Hello there, fellow dog lovers! How are you and your dog doing? We hope you guys will always be healthy always, every day, and more. Hey, have you seen a stray dog lately? On the street nearby your neighbourhood or work place? 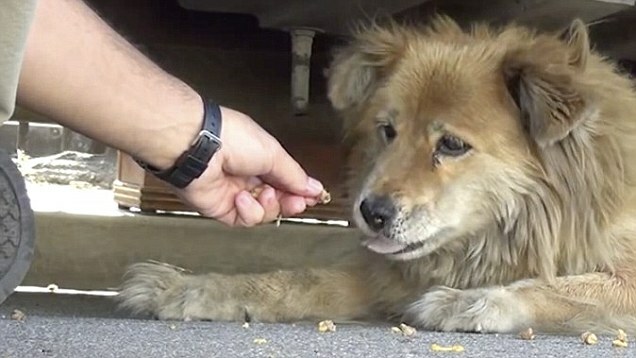 Have you seen how much she is struggling to find food, especially in our country when most people are scared to dog? Sometimes, if you are “lucky” enough you will see some heartless strew hit a poor stray feral dog out of nowhere. No wonder, most of the stray dog become a feral dog and you know what? They are scared and will always be scared because of human as long as their live on the street goes on. Their lives continue but their pain will never stop. Is not easy for a dog to ask for food, not like cat, especially in a country full of people who suffered a phobia against dog. Which is why, as a dog lover it is time to act as a saviour. You could save him by bringing her to your home or simply feed her every day; your choice and it is all up to you. However, you will indeed find some difficulties on doing so, for example, when you try to help her and after a few steps approaching her, she suddenly flees away and scared of you. No wonder though, live on a street is harsh and painful. Which concludes, today Animallova would help you on Best Effective Ways to Pet a Scared Feral Dog. Dog is a magnificent animal. As dog has proven many times as the most loyal animal companion for human. If you have one and you take care of her properly, we guarantee it there’s a greater chance of her to greet you happily every time you come home. Now, tell us, what other animals that do the same? Cat? No, she only greets writers when she’s hungry, but dog simply just happy to see you at home again. There are many researches that prove dog has similar psychological structure as human. No wonder they could feel pain as we do, and they could also feel our pain. If you are sad, try to approach you dog; she will understand that your heart is gloomy and will try to approach you with a gesture with has meaning such as “don’t worry friend, everything is alright.” What a wonderful adorable creature she is. Now, with such psychological condition, dog surely easy to hurt as human does, especially with a physical abuse. Yup, they almost had it every day, especially in such dog phobic country. No wonder, you could see most of the stray dog has turned into feral but scared dog. The pain the feral dog endure is unbearable, and even it would create a great trauma towards human. Which is why, you might find difficulties on approaching her. She will flee away from you or she could bark angrily at you and even bite you in the arm. Don’t blame her though, just focus on your task here which is whether to adopt her home or to feed her every day. One could simply give any feral stray scared dog a food, but petting her will be a different thing, especially to a scared feral dog. Yup, you could simply throw away the food on her sight and take a few steps back then watch her feed from distance or you could try to pet her which is quite difficult to be applied on. It would not be easy but in truth it will only requires two simple things yet hard to do which are your passion and patient for dog. First thing you can do is to make sure that you visited the dog every day. Try to call her by your own given name to her such as Boy, Jack, Chuck, or any names you prefer. Call her until she sees you and recognize that you are the one who’s been calling her. This name calling even though it looks easy, but in truth it is quite effective on her as she will start to recognize you. After she recognize you, don’t forget to give her a food. Giving her a food while calling her will fasten up the trust process which means that the frequent you give her food and calling her name the quicker, she will recognize you and will allow you to pet her eventually. You could give her some edible human food for dog such as bread and meatloaf. Just don’t forget to feed her regularly; we recommend you feeding her for at least once a day in order to fasten up the process. After a few feeding sessions, she will start to become comfortable around you. The real sign of this is when she starts eating in front of you and barks happily. In writer’s case a stray dog who is comfortable enough with new stranger will become excited every time she sees that person, especially when that person brings her favourite food, yummy. When this happens, then it is time for you to try petting her. You could start petting her on her head. If she’s comfortable with it, then you can continue petting around her body. Also, if you are lucky enough, she will ask you to rub her belly; no dogs could refuse the sensation of belly rubbing. Congratulations, you have successfully pet and care a scared feral dog. Then what should you do next? The answer is entirely up to you. The main questions will be, do you want to bring her home, or do you simply just want to feed her on the street every day? Well, we suggest you bring her home, especially if you are looking to adopt another dog, but if you can’t afford any just simply visit and feed her every day, good luck!